Legacy Christian sophomore Jonathan Riddle (7) scores his second goal of the night, Oct. 15 in a boys high school soccer match against Springfield Northeastern on the Athletes In Action Sports Complex football field in Xenia. Legacy Christian Academy senior Jonathan Cosenza (16) makes a cross pass to Kevin McEntrye for a scoring chance against Northeastern in Monday’s Oct. 15 boys high school soccer match in Xenia. Legacy Christian senior Josh Stover (13) makes a cross pass early in the first half against Northeastern, Oct. 15 at the Athletes In Action Sports Complex football field in Xenia. 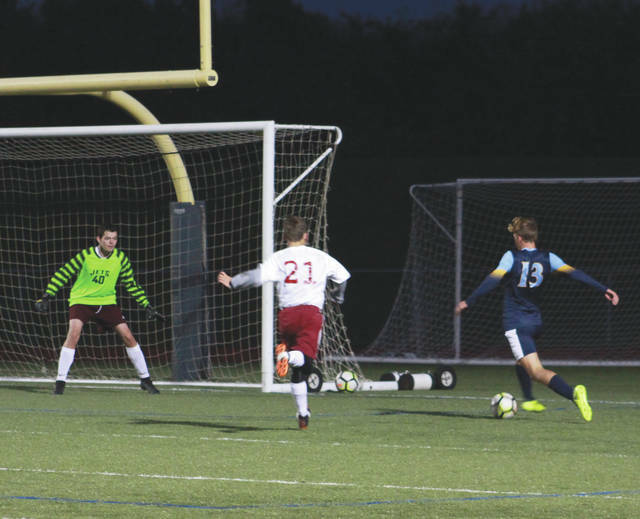 XENIA—The Legacy Christian Academy Knights advanced to 11-5-1 after they dominated the Springfield Northeastern Jets on Monday, Oct 15 by a score of 6-2 in a boys high school soccer match at the Athletes in Action Sports Complex. The Legacy starters never let the Jets get any momentum. The Knights put up five goals in the first half. They were never really pressured defensively, and consistently were in the offensive zone. “The team played with a lot of poise, and our focus on possession was evident,” Legacy Christian coach Nathan Anthony said. Sophomore Jonathan Riddle was consistently a force in the middle. He opened up the scoring and scored twice in the first half. Freshman Kevin McEntrye also chipped in two goals, while senior Josh Stover scored the fifth goal of the half. With the game in hand, Anthony sent out his junior varsity unit to play the second half. The JVs struggled a lot initially, dealing with Northeastern’s varsity squad. They gave up some lead passes and made a few mistakes defensively that allowed Northeastern’s senior midfielder Deric King to score twice. However, by the end of the half the Knights seemed to settle in a little bit. Sophomore Jacob Thompson scored the sixth goal for the Knights. Following this victory, Legacy Christian will face a conference opponent in Troy Christian. Troy Christian (12-1-1) is currently tied with Dayton Christian for the Metro Buckeye Conference lead with records of 4-0-1 in the division. The Knights’ MBC record is currently 1-4-0. While Anthony expects, and relishes the idea of being underdogs against Troy Christian, he said he thinks the game against Northeastern was a good way to prepare for that game. Legacy Christian will play its next game at 7 p.m. Thursday Oct 18 at Troy Christian. 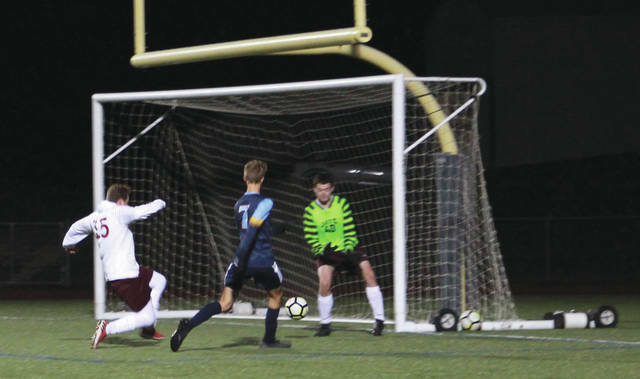 https://www.xeniagazette.com/wp-content/uploads/sites/32/2018/10/web1_JonathanRiddle_PS.jpgLegacy Christian sophomore Jonathan Riddle (7) scores his second goal of the night, Oct. 15 in a boys high school soccer match against Springfield Northeastern on the Athletes In Action Sports Complex football field in Xenia. 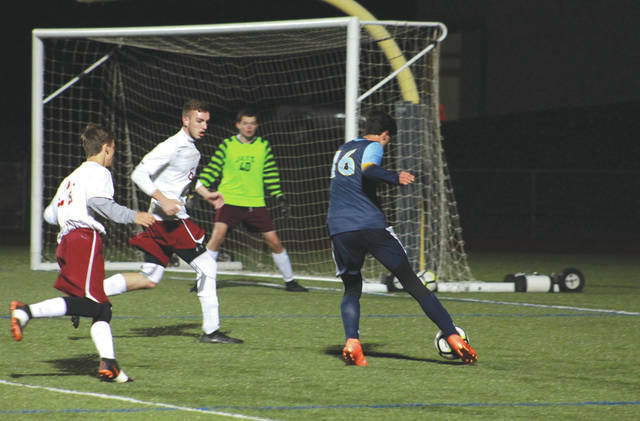 https://www.xeniagazette.com/wp-content/uploads/sites/32/2018/10/web1_JonathanCosenza_PS.jpgLegacy Christian Academy senior Jonathan Cosenza (16) makes a cross pass to Kevin McEntrye for a scoring chance against Northeastern in Monday’s Oct. 15 boys high school soccer match in Xenia. https://www.xeniagazette.com/wp-content/uploads/sites/32/2018/10/web1_JoshStover_PS.jpgLegacy Christian senior Josh Stover (13) makes a cross pass early in the first half against Northeastern, Oct. 15 at the Athletes In Action Sports Complex football field in Xenia.